This picture is taken at the Jesus House. The man at the head of the table is Tim Sparks, a ministry partner and friend. He has gone home to the Lord, but as you can see he welcomed people to the table with us. 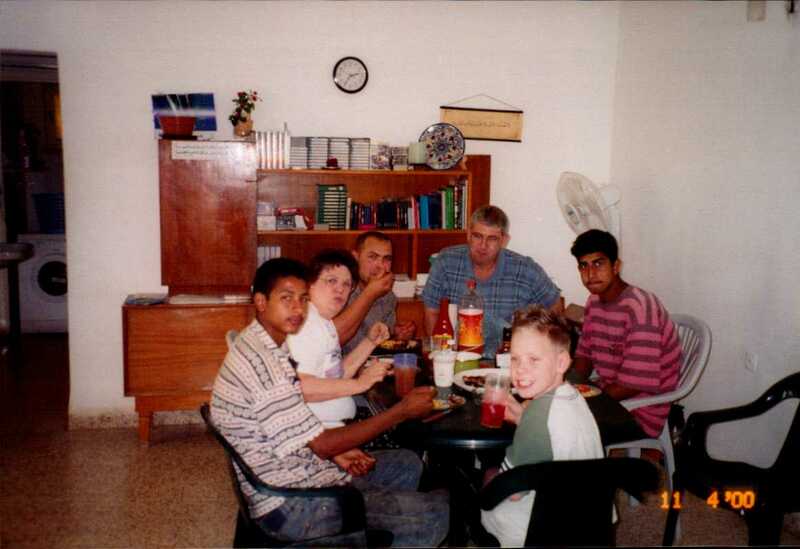 Eating at the Jesus House was unusual because we actually sat at the table to eat. We ate American food because that was all I knew how to cook. I never mastered cooking like the Palestinians. 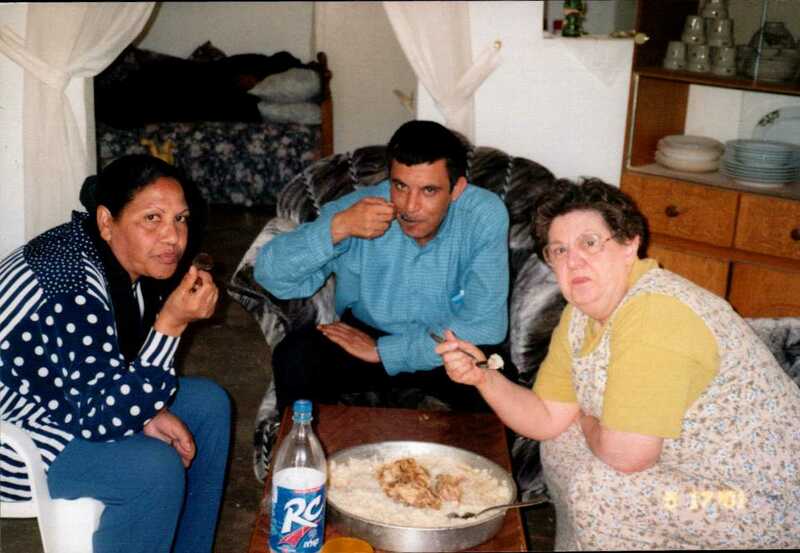 One of the things many of the Palestinians loved is iced tea. They had never heard of iced tea until I introduced it to them, then they asked for it when they came to fellowship. 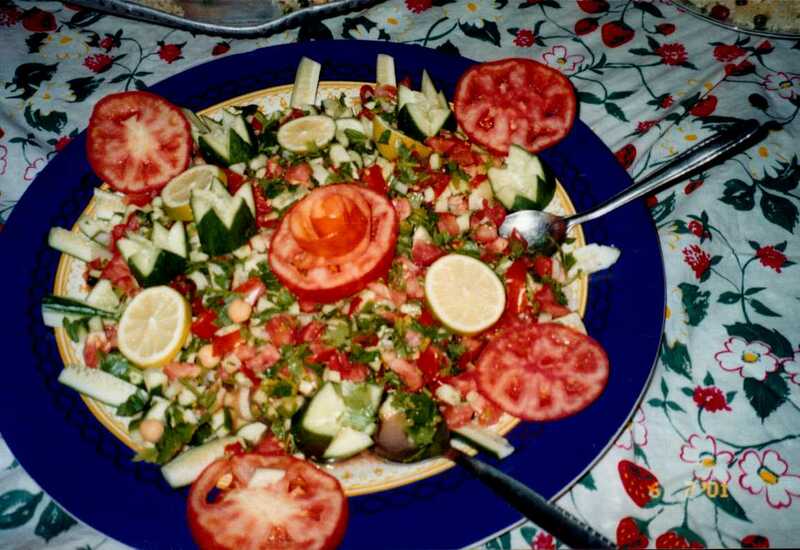 Now this is a beautiful picture of an Arabic Salad. We were invited to a friend’s house to eat. You never knew when you accepted a meal at a friend’s house where you would sit to eat your meal. At this particular home we sat on the floor. You can see they used a beautiful table cloth and the whole meal was as beautiful as this salad. I found out you can sit on the floor and eat if you have to. This is me eating something called Manssif. That is a Palestinian dish that is cooked outside over an open fire for about half a day. It can be made with chicken or goat but it is always made with rice. It is usually cooked for celebrations. This is a picture of our dear friend and a believer, Fotma, and the other person is our interpreter, Nasser. As you can see we are sitting on overstuffed chairs eating out of the pan with spoons. Eating with utensils is not normal over there. Most of the people who eat Manssif do so with their fingers. All dip into the pan at the same time, put it in their mouth and then go back for more. You really have to trust God because you can’t worry about germs. Fotma, Nasser and Jan at an engagement party. There is a part of me that misses the excitement of not knowing who I will be eating with or if I will be at a table, on the floor, or on a couch. I miss my friends in Jericho. I do want to say that our dear brother and interpreter, Nasser, has gone home to be with the Lord. We are not sad because he accepted Jesus years before and we are happy we could be part of his life. I hope you enjoy the next time you sit at a meal with family or friends and think of all the different ways you could enjoy your meal.